Compared to thermal plants, hydroelectric plants are much more efficient in converting energy to electricity. Most hydroelectricity, by far, is generated in conventional hydroelectric dams. Another type of power dam is called run-of-the-river, which is discussed in this section. Micro hydroelectric dams are also discussed in relation to small streams. Another type of dam is specifically designed for pumped storage. This section explains the operation of these plants. The basic parts of a hydroelectric generating system are illustrated in Figure 1, which shows the dam with its reservoir and penstock (or tunnel), the turbine and generator, and the transmission substation. A large screen is located in front of the inlet gate to keep debris from damaging the turbine. The inlet gate controls the amount of water that flows through a penstock; large dams have multiple penstocks, gates, and generators. The penstock directs the water to the turbine blades to spin the shaft at a high speed. The shaft is connected to the armature of a generator. After giving up most of its energy, the water passes through a channel called the tailrace to a relatively shallow storage area called the after bay. Inlet gates in the penstock are usually completely open, but large drive motors can adjust the gates to control water flow. The inlet gates can also be completely closed to drain the penstock when it must be inspected or when maintenance is performed on a generator. Figure 2 shows a series of generators mounted in a single dam. Each generator produces three-phase AC. Outside the generators, a substation uses transformers to increase the voltage for transmission. The generator outputs are connected in parallel using switching circuits within the substation. Because they are in parallel, a single generator (or more) can be taken offline for repairs or maintenance, or it can be removed from service if the electrical demand is down. The operation of the hydroelectric dam in the production of electrical power is based on basic concepts. Water is stored behind the dam. As more water is stored, its level becomes higher, and its ability to produce electrical energy increases. The higher the reservoir, the greater the head and quantity of stored energy. The dam has spillways that are built into it to allow water to be released and to avoid overfilling the reservoir during rainy periods. Water in the spillway does not go through the penstock and past the turbine, so its energy is lost. It is important that the water level is not allowed to increase to the point where water runs over the dam because this can damage the dam structure. During dry periods, the amount of water being released may exceed the incoming flow, so the level of the reservoir may drop. When this occurs, the available energy decreases because of the decreasing head. Figure 2 Generators for a Hydroelectric Dam. 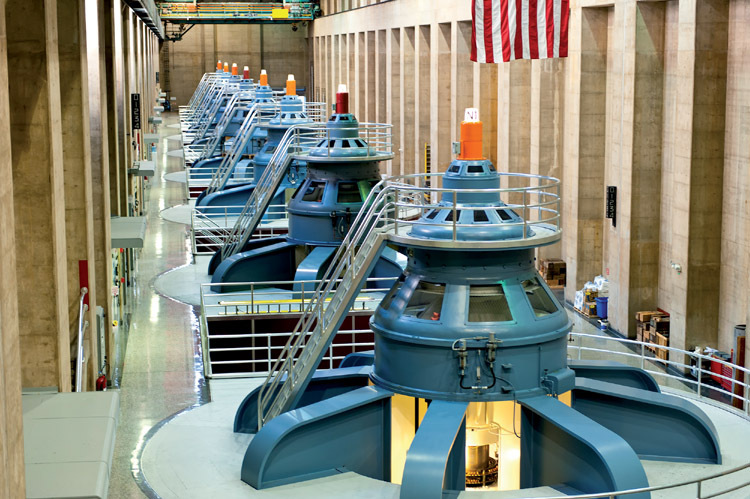 A hydroelectric dam can have multiple generators; each can have its own penstock and turbine. When a generator is to be used, the inlet valve to the penstock is opened. Most dams have surge tanks connected to the penstock to reduce water hammering in the penstock. When water first enters the penstock, the surge tanks accept some of the water to reduce the quick increase of pressure, which could cause damage. The amount of electrical power the generators can produce depends on the current head in the reservoir and the quantity of water that is allowed to flow to the turbines. A pumped storage system is a system of two dams, each with a reservoir. One is located at a much higher elevation than the other. Water is released from the higher reservoir to produce electrical power. The water is captured in the lower reservoir and pumped back during off-peak hours to the higher reservoir, where it is used again. 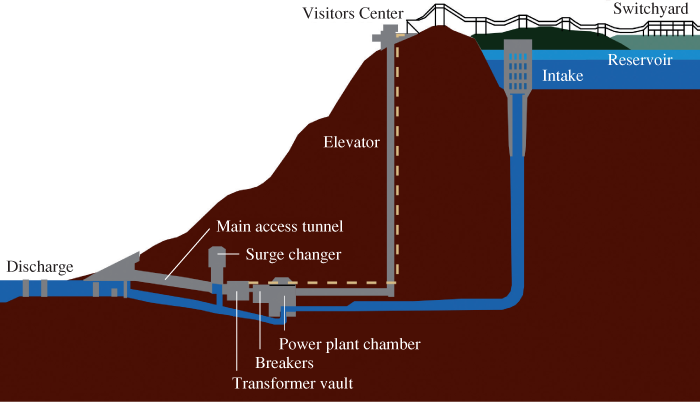 Figure 3 shows a basic diagram of the Raccoon Mountain facility, which belongs to the Tennessee Valley Authority (TVA) located on the Tennessee River. During low-peak electrical hours, water is pumped from the lower reservoir into the higher reservoir. During the highest peak times, when electrical energy is needed on the grid, water is released from the upper reservoir, and it flows down through penstocks to turbines, as in a traditional hydroelectric dam, producing up to 1,600 MW for the grid. The water is released in the bottom of the lower reservoir, where it can be returned to the higher reservoir during times of low electrical demand. The generator in a pumped storage facility can act as a motor, so technically it is called a motor/generator rather than just an AC generator or alternator. When water from the lower reservoir is to be pumped to the higher reservoir, power from the grid is applied to the motor/generator’s field windings, which causes it to operate as a large motor. The turbine becomes a large pump. The result is that water from the lower reservoir is pumped back through the penstock up into the upper reservoir. The turbine acts as a normal turbine to turn the generator when the water flows down, and it acts like a pump when water is moved up. 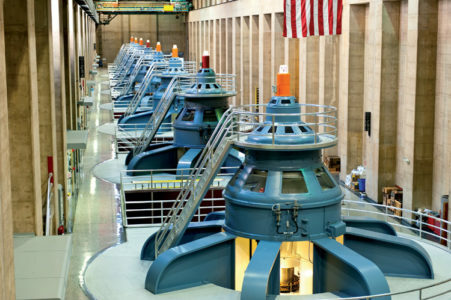 The design of pumped storage turbines is complicated by this requirement. The change from a generator to a motor is accomplished by switches. When operating as an AC generator, the output is connected to the output transformers and the grid. When the motor/generator operates as a motor, switches connect power from the grid through the transformers, which now operate as step-down transformers, and back to the motor/generator. The equipment used in the station is called the pumping generating unit because it operates as a motor and pumps when water is pumped up to the higher reservoir, and it operates as a turbine and generator when water is released from the upper reservoir to the lower one. The pump generating system is used to provide extra electrical power at the peak times when it is needed. Energy can be stored in various ways, but pumped water storage is one of the most effective. The ability to turn the stored energy back into electricity quickly during peak demand is a very useful tool for grid operators to meet demand. Run-of-the-river (ROR) is a hydroelectric system that uses river flow to generate electricity. The system may include a small dam with storage for water, but many do not. ROR dams differ from ordinary dams because they do not flood massive amounts of land or interfere greatly with marine life; instead, they rely primarily on the river flow. When a dam is part of the system, the storage area behind it is called pondage. Run-of-the-river power plants are classified as with or without pondage. A plant without pondage has no storage and is therefore subject to seasonal river flows. This type of ROR system produces electrical power only when the river flow permits it. A system that has pondage can regulate water flow to some extent and can serve either as a base-load source or can be used as a peaking power plant, which means it produces power when the demand is highest. Run-of-the-river hydroelectric systems are typically selected for streams and rivers that do not have large swings in the volume of water during the year. Rivers with the consistent flow can use a ROR system for base-load power. If the flow is not consistent, the power level from the system is forced to drop, and the system is used only to supplement power from other sources. Up to 95% of the mainstream of water in the river can be diverted to flow through the dam and then returned to the river, and this diversion has little effect on the main river flow. Figure 5 shows Chief Joseph Dam, which is located on the Columbia River in Washington State. This concrete gravity dam is the largest run-of-the-river dam in the world. 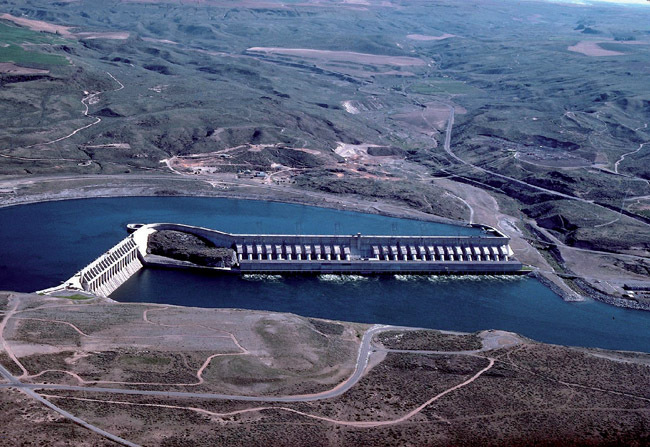 The dam has a small pondage lake; the power plant has a capacity of 2,620 MW and is the second largest hydroelectric power facility in the United States (behind the Grand Coulee Dam). Compared to conventional dams, with their large reservoirs, ROR dams are considered environmentally friendly because they have only a small effect on river flow, and they do not have large reservoirs with their accompanying environmental impact. Even with its smaller capacity, a ROR system with pondage can help with flood control to a limited extent. Figure 5 Chief Joseph Dam. The Chief Joseph Dam on the Columbia River in Washington State is the largest run-of-the-river dam in the world. Small hydroelectric dams generate between 100 kW and 10 MW. Small hydroelectric systems can be connected directly to the grid, or they can be used to provide electrical power to a building or business with grid power back up when the water level is not high enough to produce all the power that is needed. Some small hydroelectric systems are installed in remote areas because they can provide electrical power for a small community, where the grid has not been extended into the area. If a hydroelectric system generates less than 100 kW of electricity, it is called a micro-hydroelectric system. Many of the hydroelectric dams used by farmers, ranchers, homeowners, and small-business owners are basic micro-hydropower systems. In some cases, a 10-kW micro hydropower system can provide enough power for a home or a small farm. If a property has water flowing through it, a micro-hydroelectric system can be installed on the stream. The water needs as little as 2 gallons per minute (GPM). Because most streams flow day and night, the micro-hydroelectric system can provide electrical power around the clock (unlike solar or wind energy systems). The micro-hydroelectric system is considered to function as a run-of-the-river system (perhaps it would be more rightly named a run-of-the-stream system). The water is directed from the stream through a turbine and then sent back to the stream, which has little effect on the stream. There is no need for a dam and its reservoir. Generally, the micro-hydroelectric system is designed to prevent harm to fish or other wildlife in the system. Micro hydroelectric systems are now being used in developing countries to provide small amounts of electrical power for refrigeration or pumping and purifying water. Another type of very small hydroelectric system is called a Pico hydroelectric system. The Pico hydroelectric system has a generator that is smaller than 5 kW. The generator shaft is turned by a small turbine. If a water supply or stream has a drop of more than 1 m (3 ft), it has enough energy to operate a 5-kW generator. Pico hydroelectric systems typically operate the same as larger run-of-the-river systems but without pondage, so they are environmentally friendly. Water is diverted using pipes or other devices to move the water from the mainstream to the turbine and returned to the stream. The Pico hydroelectric system is very inexpensive, which means it can be installed on streams around the world, in developing countries, and especially in remote regions where other types of renewable energy systems would not function as well or cost too much to install. How does a conventional hydroelectric dam produce electrical power? How does a pumped storage system produce electrical power? How does a run-of-the-river hydroelectric dam differ from a conventional hydroelectric dam? Why does a pumped storage system have an upper and lower reservoir? Water is released from a reservoir through a penstock to a turbine. The turbine is connected to a generator that converts the kinetic energy in the water to electrical energy. A pumped storage system converts the potential energy in an upper reservoir to electricity as it falls. It can pump the water back for reuse during peak demand, but it always loses some energy in the process of pumping. A run-of-the-river system may have storage but it primarily uses the kinetic energy of the river to generate electricity. A conventional hydroelectric dam stores the energy in the lake until it is released. Pumped storage transfers water back and forth between an upper and lower reservoir in order to meet peak demands. Pumping water always requires using more energy that can later be obtained.